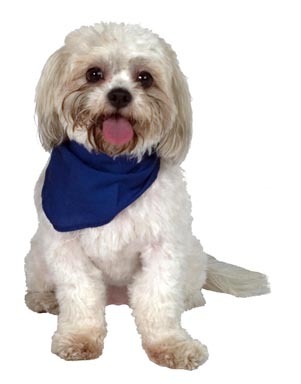 Identify your pet and add fun sayings to pet bandanas. Make a patriotic one for the 4th of July - and then keep it rolling, making a new one for each holiday or mood. Rather than regular tie-style bandanas, you might want to make a slip-ver-the-collar bandana. This type of bandana has an open pocket that slips over a collar. See this style of bandana at http://www.hotdogcollars.com. They require wholesale orders over $150, but this style of bandana would be simple to make. If you would like to sell your personalized pet bandanas, you can offer items at online groups such as http://pets.groups.yahoo.com/group/Dogshow-services-K9Crafts/ . This particular group is made up of canine enthusiasts who offer craft items member-to-member. Search for similar groups for other www.yahoogroups.com . Use polyester embroidery thread for pet products because it stands up best to laundering and outdoor conditions. You may need to loosen bobbin tension to embroider nylon webbing. Use a product such as Cover-the-Back from Gunold or fusible tricot to make your embroidery more long-lasting and avoid excessive wear from the dog’s hair. Embroidering Around the World! Embroidery Advisor Presents - How Does Your Garden Grow?